WE HAVE A FANTASTIC RANGE OF CONFERENCE ROOMS FOR SMALL TO LARGE MEETINGS, ALL WITH THE NECESSARY FEaTURES SUCH AS WiFi. YOU COULD ALSO USE SOME OF OUR 200 ACRES OF PARKLAND, FORMAL GARDENS & EVENT FIELD FOR YOUR OUTDOOR EVENTS & TEAM BUILDING. Hawkesyard Estate was the first Catholic Conference Centre in the UK and within the Estate is the Grade II listed Hawkesyard Hall, the former mansion of Josiah Spode iv. 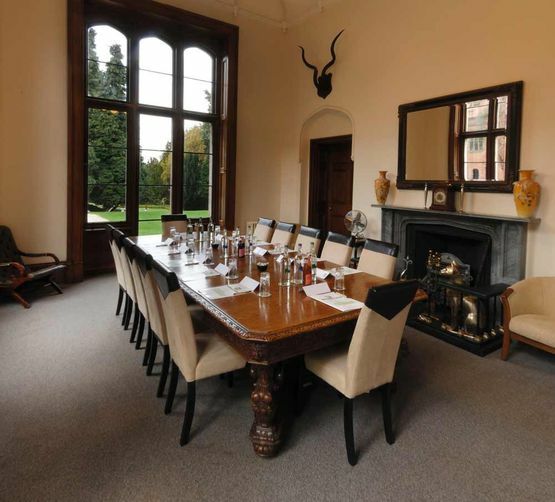 After significant renovation work the Hall is again at the forefront of creativity and design in Staffordshire and for the business wishing to make a visual statement through its offices, meetings and conferences, Hawkesyard Hall provides the perfect answer. The unique interior, rich in architectural history, provides a wide range of offices, culminating in the splendour of the Halls conference facilities which are set in the Lister Suite and Sir Robert Peel Suite, with both overlooking the manicured gardens of Hawkesyard. If you would like details of available office suites at Hawkesyard or would like to use the conference and meeting facilities within the Hall please contact us to discuss availability and your requirements. Please also pass on many thanks to Clare for all her help and diligence, helping everything to go smoothly." Hawkesyard Estate will do everything possible to accommodate all of your individual requirements for your perfect day. Allowing you to enjoy your celebrations free from stress. Hawkesyard Estate is situated in private grounds with beautiful landscaped gardens. You will not be overlooked - giving you the freedom to enjoy your day however you wish. Hawkesyard Estate boasts a grade II listed building with plenty of rooms to accommodate your requirements whether for use as a function room for a corporate event, conferences, or your dream wedding. Hawkesyard Estate can offer exclusive use of our estate and surrounding grounds for your special event. Speak to one of our team today to discuss your requirements, we are always happy to help! Hawkesyard Estate have a wealth of happy customers and returning visitors to the estate for functions including Charity Dinners, Wedding Fayres, Christmas bookings, Conferences and Weddings. When it comes to costs, Hawkesyard Estates will always try and work to your budget, and we will not charge separately for each individual service we offer. Their are no hidden costs, so you can enjoy your day or evening at Hawkesyard Estate.